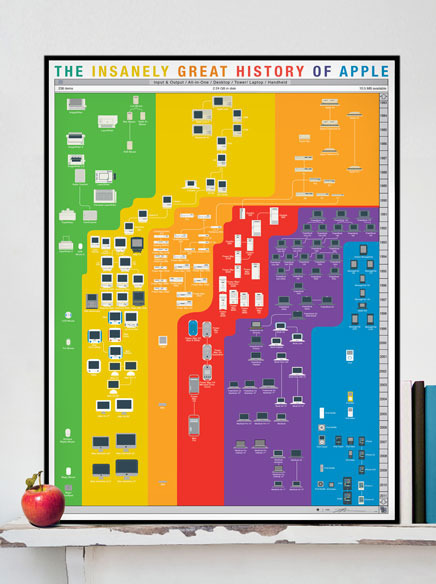 We’re big fans of the folks at Pop Chart Lab, so when we saw that they were carrying a poster that tackled the history of Apple, we were intrigued. It wasn’t a disappointment as this thing is a beauty. It follows the evolution of apple’s product lines in a clever way, showing you how our stuff got from there to here. The world’s most comprehensive mapping of Apple products, this print shows every computer released by Apple in the last thirty years, from the original Mac through the MacBook Air. Products are sorted according to type, including the connections between various form factors which have arisen as Apple has invented–and reinvented–insanely great products. The posters are 18″x24″, printed on 100lb. recycled stock and printed with vegetable inks. Each one is signed and numbered by the artists and they’re only $20 bucks.